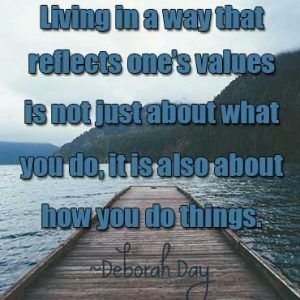 Living Your Values - Better Believe It! Life flows much more smoothly when your actions line up with your values. When what you do prioritizes the things you deem to be important, you feel happier, less stressed, and you get better results in life. Your actions always tell you what you value, but are those the values you actually think are important? Oftentimes, we spend most of our time doing things that do not line up with the things we say we value. 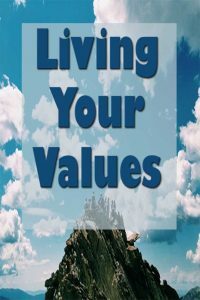 Most of the personal development books talk about the importance of values and how to make a list and define your values, arranging them from most important to least important. If you’re unfamiliar with it, get yourself a piece of paper or a blank Word document and start listing the things that are important to you. If you need some help, here’s a list to get you thinking. After you’ve listed them, prioritize them from most important to least important. If you can’t decide, think of an action that comes with that value and then decide which action is more appealing to you. For example, say you’re torn between putting “Freedom” first or “Altruism”. For freedom, picture what that means for you. Maybe you’ve quit your job and are working your own freelance business, and that seems more important to you than helping the poor teenagers in your community, which is a project you think exemplifies “altruism”. We have a finite life and only 24 hours in a day, so pick your top 10 values, arranged in order of importance. It’s just not possible to focus on more than 10 or 15 of them. These should serve as your compass in life. All the things you do in a day should be compared to this list, but more on that later. Now that you have a list of your ideal values, make another list of your actual values as they present themselves in your everyday life. For example, say Suzie has a top value of “health”. However, Suzie is 30 pounds overweight, and she never exercises. She smokes a pack a day and eats quite a few unhealthy foods. Her actions say she doesn’t value health, but in her mind, she does. So she’s conflicted and invites stress into her life as a result. She feels bad about the extra weight, so she avoids looking in the mirror like a plague. She bought a treadmill, but just doesn’t seem to find the time to use it. She buys healthy food, but it sits in her fridge as she opts to make a quick trip to McDonald’s instead because she’s just “too tired to cook”. Every day when she wakes up, she tells herself, “I’m going to quit smoking today”, but after 6 hours, she caves in to the cravings and lights one up. She has two choices. She can scratch “health” off of her list of values (or at least knock it down toward the bottom), noting that it doesn’t matter as much as she thought it did, or she can commit to making her actions line up with her value. That involves serious change, and change ain’t easy. So she really has to think and decide which path she wants to take. Living out of sync with her value causes her misery. Her self-esteem gets eroded a bit more each time she smokes in spite of her promise to quit, or each time she eats potato chips when she knows she should opt for blueberries instead. Think about all the actions you took today. Then look back at the past week. How many of your actions align with your ideal values? A lot? A few? Which values from your top-ten list are you close to living in alignment with? Which ones are you really far from? The ones you aren’t living, ask yourself – do I really value that? Decide if you want to make the effort to change your behavior or if you want to edit your values list. If you want to keep it, list the actions you will need to take in your life to get your behavior in line with your value. Very few people act in accordance with their values 100% of the time, so don’t expect perfection. The goal is to be in compliance most of the time, or at least more today than yesterday.All the little actions you do in a day add up over time. What you do today and tomorrow and the next day add up to either take you closer to your goals or farther away. You either become happier with who you are and what you do, or you stay mired in internal conflict. Evaluate how you interact with the people in your life and compare it to your ideal values list. Write down any changes you need to make. Evaluate how much time you spend on your work. Does that align? Can you make a change, even a small one, if it doesn’t align? Evaluate how you spend your free time. Do you make time for those things that are important to you? So who cares if you live according to your ideal values or not? Why does it matter? Well, it matters for three main reasons. First, if you don’t live according to what you deem is important, you get that internal conflict we discussed earlier where you feel stressed, your self-esteem suffers, and you’re just not as happy, contented, or satisfied as you could be. Second, to get results, you need to take consistent action on a certain pathway, no matter what area of life you’re focusing on. Third, your beliefs dictate your thoughts which in turn dictate your actions, and what you believe, think, and do defines who you are. 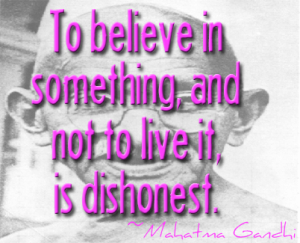 So if you value honesty and want to define yourself as honest, do honest things. If you believe in such things, you don’t get to take your things with you when you die, but you do get to take your identity – who you are. So choose well. You can re-evaluate and change your ideal values at any time. If your current values aren’t taking you where you want to go in life, maybe changing them is in order. As you learn and grow and proceed through different stages in life, your values will naturally change. Choose other values that you want to be important and that will take you toward your intended goals. Then write down the actions you will take using those values as your compass. Knowing your values gives you a boost when you’re facing a difficult decision or a fork in the road of life. By reviewing your values, you can more easily decide what course of action to take that is best for you. Your values serve as your internal compass.